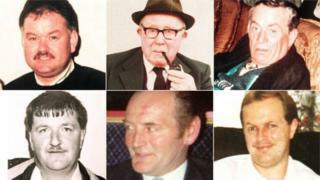 A police ombudsman's ruling that there was collusion in the 1994 murder of six Catholic men is "unsustainable in law", a judge has said. The men were shot dead by loyalist paramilitaries as they watched a World Cup football match in a pub in Loughinisland, County Down. In June last year, the police ombudsman ruled there had been collusion between some police officers and the gunmen. The ombudsman's office said it would "consider the comments carefully". DUP MP Jeffrey Donaldson and TUV leader Jim Allister have both called on the ombudsman, Michael Maguire, to consider his position, following the judge's scathing criticism. However, Mr Maguire said he isn't for quitting and may appeal the damning judgement. "I have a job to do on thinking through how we deal with those complaints; my focus is on looking at the implications and what steps are to be taken. "I will not be considering quitting," he added. Two retired officers are attempting to have Dr Maguire's report quashed in a legal challenge. Mr Justice McCloskey said the authors of the Loughinisland report were "careless, thoughtless and inattentive in the language and structuring of the document". He also said the police officers deemed to have colluded with the gunmen were "in effect tried and convicted without notice in their absence". This was a damning attack on the report and the office of the Police Ombudsman. The judge said the effect of the ombudsman's ruling was that none of the police officers accused of collusion had the protection of due process of the law. It was just criticism after criticism. Whether or not this means that the report will be quashed is unclear. The two retired officers who brought the legal challenge wanted it quashed today; that did not happen. The court will reconvene on 12 January and the judge will receive further legal submissions before making a final ruling. A spokesperson for the ombudsman's office said: "We respect the judgment of the court, and are clearly disappointed. "We will need time over the coming weeks to consider it carefully. "Clearly, however, we have to wait until the final outcome." The victims were watching the match between Ireland and Italy when loyalist gunmen burst into the Heights Bar in the County Down village and opened fire on 18 June 1994. The men who died were Adrian Rogan, 34, Malcolm Jenkinson, 53, Barney Green, 87, Daniel McCreanor 59, Patrick O'Hare, 35, and Eamon Byrne, 39. After the hearing, Adrian Rogan's daughter, Emma Rogan, said: "Last year we felt we were given truth... and dignity was restored to our loved ones, and this year it has been suffocated once again. "We will go home, celebrate Christmas and we will regroup and focus out energies on our campaign." Former Northern Ireland Justice Minister David Ford said the judge's comments would "do nothing to provide comfort" to the six bereaved families. He said they also emphasised the difficulties in tackling "enormously complex legacy issues".